Bamboo broker Andy Royer sorts dried bamboo. FOR MANY of today’s anglers, bamboo rods bring back memories of bygone years, when fishing was simpler, perhaps less demanding, and a time when bamboo was really the only rod material available. Even though modern technology enables us to create a much wider variety of rods today, some anglers, including myself, still think fondly of bamboo rods as wonderful instruments for casting and fishing. My first fishing experiences were with an old Montague bamboo rod, when I fished for cutthroat trout in a small mountain stream in southwestern Montana, when, lacking finesse, my only thoughts were how could I fool a fish by sneaking a grasshopper into the stream without being seen. I grew up at my parents’ El Western Motel in Ennis, Montana, home of the famous Madison River. It was there that I met my fly fishing mentor, Howard Sykes, a skillful fly fisher from New Jersey, under whose careful eye my love for fly-fishing blossomed. Howard’s favorite rod was a Leonard bamboo. As he taught me to cast and to fly fish, he often let me use it, and I became enamored of its precision and grace in presenting a fly. 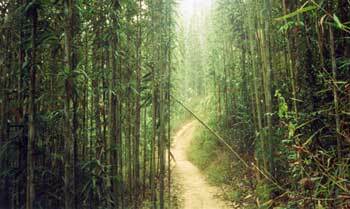 The Guangdong province of China is the source of cane for most modern bamboo rods. In those days, I often showed our motel guests where to fish, and gradually I grew into an early career as a fishing guide. Anglers came from all over the United States to fish the Madison River and nearby streams, and I regularly guided many of them. Naturally, they always brought with them their favorite rods, bamboo rods made by Winston, Orvis, Leonard, Powell, Payne, Phillipson, and Paul Young. Many of these rods were the finest examples of bamboo rod making, and, as these anglers let me try their rods, my appreciation for bamboo rods grew, as did my passion for them. As a result of these experiences, I assembled my own collection of bamboo fishing rods including an old Heddon, a Phillipson, an Orvis Battenkill, and several Winstons. I fished almost exclusively with bamboo rods until the early ’70s and even later when I had lots of other material options. At that time, I had no idea that one day I would own one of the famous companies in fly fishing, the R. L. Winston Rod Company. When I bought Winston in 1973, the company was making fiberglass and bamboo rods. Shortly thereafter, graphite was introduced as a rod-making material, and it quickly replaced fiberglass. Even though the bulk of our rods were made from composite materials during my tenure at Winston, we continued making fine bamboo rods. My partner, Glenn Brackett, and I greatly valued the tradition of bamboo rods, and we were clear that we wanted to continue their heritage in Winston’s history and the sport of fly fishing. We continually refined the rod tapers and production methods to improve the quality necessary for great rods. This work gave me extensive experience working with bamboo, designing rod tapers, and creating rods that I still cherish. 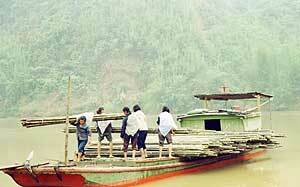 The harvested bamboo is loaded onto boats for the trip down river. Despite the popularity of graphite as a rod-making material, it hasn’t entirely replaced bamboo rods, many of which are still highly prized by anglers not only for their collector’s value but also for their great fishing attributes. How could this be? Perhaps the greatest reason is that bamboo rods have been the foundation of our modern fly fishing heritage since the late 1800s. There have been countless rodmakers pursuing the craft of designing and building rods to match their ideas for the perfect casting and fishing rod. Many of these rods are truly works of art; they represent the attainment of near perfection in the embodiment of form and function. Bamboo rods have an inherent charm because their materials are natural and often decorated with jewel-like hardware, subtle thread colors, carefully wrapped guides, graceful cork grips, and wood seats. The natural color of bamboo is a light straw color and, with heat-treating, ranges to a dark caramel tone. Its delicate grain radiates through the typical high gloss varnish finish, and the various colored wrapping threads serve to highlight this natural beauty. Bamboo as a material is also unparalleled in its strength and resilience. Most rods created decades ago still retain their original casting and fishing capability. Moreover, there is a substantial market for used bamboo rods created by master craftsmen from previous eras, and, happily, many of these rods are still fished. The fine bamboo rods created in the past have continued to increase in value over time because of their intrinsic value and the fact that the craftsmen who made them are no longer alive. The green bamboo is collected and cut. And, finally, there is another reason that many modern anglers often forget or overlook bamboo rods: they can be absolutely great fishing rods. Bamboo construction doesn’t guarantee great rods, but it lends great potential to the handiwork of a master craftsman. As with any rod-making material, proper design is crucial. In my opinion, because of its inherent heavier weight, bamboo is the most challenging material with which to design rods for perfect action. However, this relatively small increase in weight, particularly in trout rods, is also one of its advantages, for this additional weight gives these rods a loading characteristic that makes them very smooth casting. Another important design feature of most bamboo rods is that they are designed to comfortably cast the distances most anglers fish for trout, whereas many of today’s composite rods seem to be designed to win distance-casting contests. Bamboo rods have the finesse needed for making delicate casts to wary fish while at the same time possessing excellent fish-playing capabilities. In my view, a lot of modern anglers have missed the joys of fishing that come with rods that their predecessors developed over many decades of angling. It is then stacked and left outside for drying. In its heyday, virtually all rods were made from bamboo, but with the development of fiberglass and then graphite all of the major companies quit their bamboo production. For a time there were very few bamboo rods being made. That slowly began to change in the ’70s with the publishing of the Master’s Guide To Building A Bamboo Fly Rod by Hoagy Carmichael and Everett Garrison. This book became the Bible of amateur bamboo rodmaking, and even though no major companies restarted making bamboo rods, lots of amateurs did. 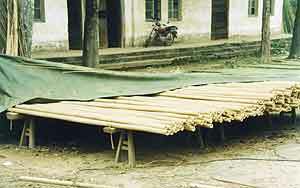 Since the publishing of this book there have been a number of others written with different viewpoints describing the bamboo rodmaking process. The invention and proliferation of the Internet has probably done more to promote the growth of this pastime than any other single thing. When I first started in the business in the early ’70s there was almost no information available whereas now it seems to be almost unlimited. Another great aspect of the Internet is the sharing of information among rodmakers around the country, Canada, and the world. The dried bamboo is gathered for sorting. Most of today’s bamboo rods are made by hand planing using an adjustable steel form and a block plane to cut their finish strips. Some do use power milling machines to rough cut strips to save time in planing and to avoid waste, but for most amateurs that is an overkill. I invented a Hand Mill that operates in a similar fashion to a power mill, only it is pushed by hand. It offers the versatility of easily cutting 4-, 5-, and 6-strip splines just by changing cutter heads. This feature has greatly increased the interest in making 4- and 5-strip rods that were previously difficult to make using planing forms. One of the wonderful aspects of bamboo rodmaking is the ability of the maker to design their own tapers or, as many do, to duplicate the tapers of previous master makers. There are now several thousand bamboo rodmakers scattered around the world, making rods for themselves and friends. Many of them also sell a few rods to supplement their income. 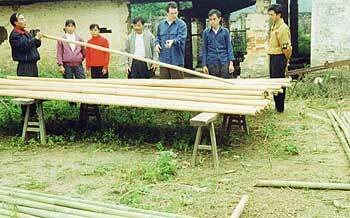 There are even quite a few that make their living from bamboo rodmaking. In my view, there are more great bamboo rods being made today than anytime in the past and upon close inspection the workmanship is, on average, better. One question that frequently comes up about today’s bamboo is its quality compared to bamboo from previous eras. There are several importers of rodmaking bamboo today but most of it is imported by two brokers: Harold Demarest and Andy Royer. Demarest still purchases his bamboo from suppliers that his family has had ties with for many years and long before the embargo caused by the Korean War that was the end of most commercial bamboo rodmakers. I personally think that the best bamboo being imported today is sold by Andy Royer. 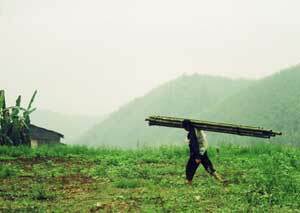 To find material he travels to the tiny village of Aozai in the Guangdong Province. This is the same village that the botanist F.C. McClure, the Westerner who named the rodmaking bamboo Arundinaria amabilis in the 1920s, identified as the center of the Tonkin bamboo region. Andy thinks that things aren’t much different now than they were then. 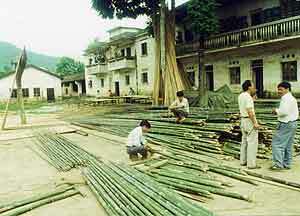 The collection of bamboo is still a slow process; the poles are cut by hand and carried out to rivers in small bundles. Upon reaching the river, the bamboo is scrubbed by hand using sand from the riverbank. From there, the poles are either floated down the river in rafts or carried on boats. 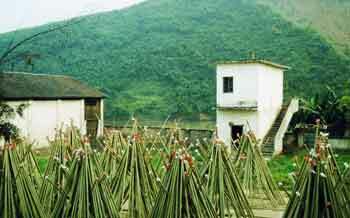 The bamboo is then dried, sorted, and bundled into groups of ten poles for shipping. 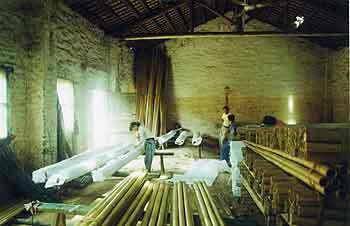 The sorted bamboo is prepared for shipping. The bamboo that I used to get when I was at Winston had several defects, but some of these are absent in what I receive from Andy. The poles no longer have grower’s marks incised on the butts, or areas that are damaged when the poles are heated over a fire then bent over an iron stake to straighten them. A great many poles are rejected in China because they are not straight, have large areas of damage or discoloration, have shallow power-fiber depth, or are not dense. This presorting provides bamboo poles that have a much higher overall quality than I have seen before. Even with today’s high quality bamboo, making a great rod still requires knowledge and integrity by the maker. The process of carefully selecting bamboo for straightness, strong power fibers, density, and lack of cosmetic blemishes is a time-consuming task. All of the preparation work must be carefully done to maintain the integrity of the bamboo. The nodes are usually hand filed, heated, and gently pressed to level the bamboo surface without damaging the fibers. Proper heat treating is also essential to increasing the modulus of elasticity of the bamboo and to making it more set-resistant. But these are only a few of the many processes that go into making a quality rod. The prices for quality bamboo rods may seem high based on a comparison with many of today’s composite rods, but I assure you that they aren’t. If you look at today’s prices compared to a generation ago, in real dollars they are a bargain. When you buy a bamboo rod either made by someone in the past or one made currently you are really buying a part of the maker, someone who has put their own unique personality into the rod. And you are buying an heirloom that you can pass on to a future generation to use and appreciate — after, of course, you have spent a lifetime enjoying it.